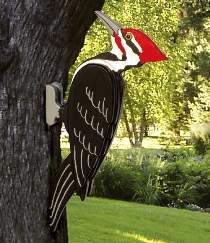 The word pileated is derived from the French word pileus which means felt cap. This bird is so named because of the distinctive crest of red feathers from his beak to the top of his head. All patterns are drawn FULL SIZE. Measures 17"L. This project is designed to be displayed in the position shown, either on the side of a tree or the side of a building structure. Can be mounted with either fiberglass rods or a flush mount hanger. Order yellow eyes and either one flush mount hanger set or one fiberglass rod separately below.